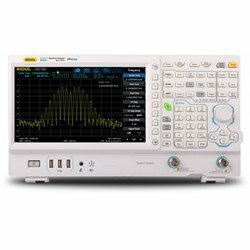 Rigol RSA3000 Spectrum Analyzers ! !Special Offers!! High quality real-time spectrum analyzer from 9 kHz to 3 GHz bandwidth, up to 40 MHz real-time bandwidth, 10 Hz - 10 MHz RBW and a 25.6 cm (10.1") touchdisplay with 1024x600 pixel. High quality real-time spectrum analyzer from 9 kHz to 3 GHz bandwidth, up to 40 MHz real-time bandwidth, 10 Hz - 10 MHz RBW and a 25.6 cm (10.1") touchdisplay with 1024x600 pixel. Including Tracking Generator 100 kHz - 3 GHz. High quality real-time spectrum analyzer from 9 kHz to 4.5 GHz bandwidth, up to 40 MHz real-time bandwidth, 10 Hz - 10 MHz RBW and a 25.6 cm (10.1") touchdisplay with 1024x600 pixel. High quality real-time spectrum analyzer from 9 kHz to 4.5 GHz bandwidth, up to 40 MHz real-time bandwidth, 10 Hz - 10 MHz RBW and a 25.6 cm (10.1") touchdisplay with 1024x600 pixel. Including Tracking Generator 100 kHz - 4.5 GHz. in 21-40 days in stock.